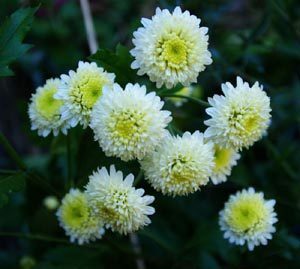 (Autumn Chrysanthemum, Huangshan gongju) Evergreen subshrub native to China and hardy to 0 degrees F, an ancient cultigen that cannot be propagated by seed. 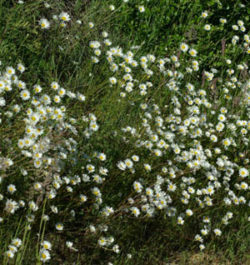 This is a choice cultivar with small, fall to early winter blossoming flowers of yellow and cream. 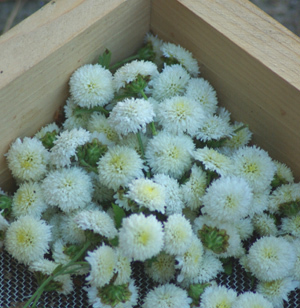 Strong flavor, taste sweet to slightly bitter, a superior flower for making Chrysanthemum tea. 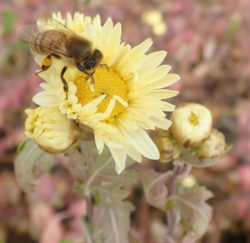 The main harvest of these flowers occurs in my Zone 7 garden around November 15, significantly later than the Bo-ju-hua cultivar. 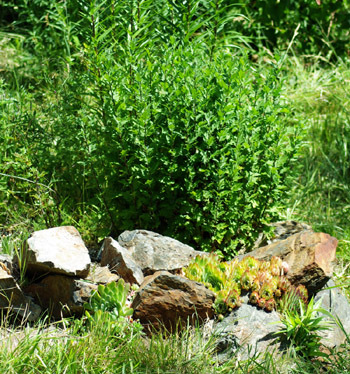 Plant prefers sun and well-drained garden soil, frequent watering. Space plants 2 feet apart. Hi, do you have some seeds of the Gong-ju-hua?? The Ju-hua are sterile cultigens, they don’t make seeds. You can start a patch with 3 plants. They spread out from the crown. You can make cuttings after they become better established, and produce more plants to widen the patch. Sorry, we cannot ship plants to Mexico. The bo and gong are carefully described in the monographs–there are many differences–please read the monographs and it will answer your question. Hello, around what size are the plants that one would receive ? We aim to give a big enough plant to assure your success. These particular plants will be in 3 or 4 inch pots and low-growing at this season would be preferable to etiolated. When can I transplant outside? Hello Maggie, Acclimatize slowly to outdoor culture and plant out anytime after they have hardened off. These are extremely cold-hardy once they are established in place.